Baked Teriyaki Chicken Drumsticks might be just the Japanese recipe you are searching for. This recipe makes 1 servings with 1093 calories, 99g of protein, and 46g of fat each. For $4.68 per serving, this recipe covers 42% of your daily requirements of vitamins and minerals. It works well as a rather expensive main course. 2 people have made this recipe and would make it again. Head to the store and pick up chicken drumsticks, vegetable oil, teriyaki sauce, and a few other things to make it today. To use up the honey you could follow this main course with the Honey Gingerbread as a dessert. It is a good option if you're following a gluten free and dairy free diet. From preparation to the plate, this recipe takes approximately 45 minutes. All things considered, we decided this recipe deserves a spoonacular score of 76%. This score is solid. 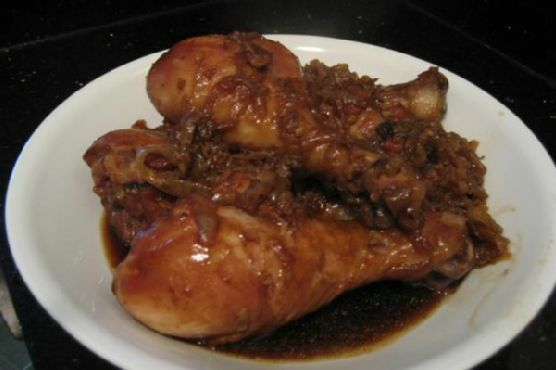 Try Baked Chicken Drumsticks, Baked Chicken Drumsticks, and Baked Chicken Drumsticks for similar recipes. Riesling, Gewurztraminer, and Chenin Blanc are my top picks for Asian. The best wine for Asian food depends on the cuisine and dish - of course - but these acidic whites pair with a number of traditional meals, spicy or not. The Chateau Ste. Michelle Cold Creek Vineyard Riesling with a 4.2 out of 5 star rating seems like a good match. It costs about 15 dollars per bottle. The Cold Creek Riesling is made from 40-year-old vines which contribute fruit intensity and concentration. This is a ripe, lush style of Riesling with aromas of ripe peaches, dried apricots and spice notes. It displays beautiful ripe fruit flavors with a crisp finish. In a large bowl, mix teriyaki sauce, salt vegetable oil, honey, and ginger. Add the chicken to the marinade. Let the chicken marinade for about 4-5 hours. Preheat oven to 450 degrees. Add the sliced onions and diced garlic on the baking pan. Lay the chicken on top of the onions and garlic. Bake the chicken for 30 minutes turning once until cooked.